Special Containment Procedures: SCP-531 statues are effectively harmless when kept facing each other. When not being studied they are stored in matched pairs in the medium-security facility █████, placed in wall alcoves on opposite sides along a marble-lined hallway in an arrangement that approximates the circumstances where the original pair was found. The alcoves have sliding doors that can be closed via remote control to make it easier to approach them for maintenance or experimentation, or on those occasions when there are an odd number of statues in inventory. There are currently fourteen statues in inventory, numbered SCP-531-1 to SCP-531-14. If it is anticipated that the Foundation will have an odd number of SCP-531 statues in inventory for an extended period of time (i.e., it is not a temporary condition resulting from an in-progress test), a D-class personnel should be assigned to ensure that all statues have a partner. It is better to do this in a controlled manner than risk an accidental exposure. 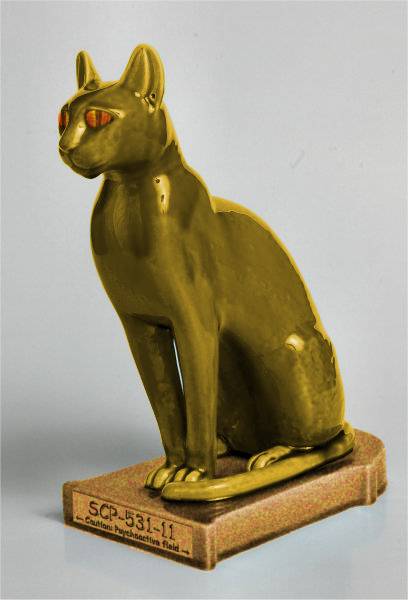 Description: SCP-531 consists of several paired sets of brass statues depicting stylized felines. The cats are in a seated posture, looking forward with ears raised in what is usually described as an 'attentive' expression. Each cat is 74.2 cm tall and is solid metal weighing 451.7 kilograms. Their eyes are inset with what appear to be polished tiger-eye stones that give an impression of luminescence, though they do not directly emit visible light. The original pair of these statues was found by an archaeological expedition in a tomb near ██████████ █████, Egypt, that dated to approximately ████ B.C. The outer chamber of the tomb had been thoroughly looted in antiquity. The two SCP-531 statues were located in the passage leading to the inner chamber, in alcoves 54 cm above the floor on either side of the passage and facing each other across it. Although the passage was open, no looting had occurred beyond this point. The expedition's members experienced an extreme aversion to passing in between the two statues and it is speculated that this psychological barrier is what protected the inner chamber from prior looters. The expedition managed to overcome this barrier through [DATA EXPUNGED] means and proceeded to retrieve the tomb's artifacts (no other SCP items were among them but they were later impounded at a Foundation facility anyway - see annex 531-B). The last items to be retrieved were SCP-531 themselves. One of the two statues was hoisted down from its alcove and crated for transport, with the plan being to crate the second one the next day. At some point during the night [REDACTED] went missing and a new replacement statue was found occupying the vacated alcove. The expedition decided to re-seal the tomb with these two statues remaining in their alcoves. The statue they had placed in a crate was taken with them to the █████████ institute, where another individual went missing and another new statue was found in storage paired with the original. It was at this point that Foundation staff retrieved both pairs of statues along with the other artifacts from the tomb. Note: Due to sloppy record-keeping by [REDACTED] (who was lost during early testing of SCP-531's properties) it is not known which two of the four statues impounded by the Foundation at that point were the 'originals'. When a pair of two SCP-531 statues are facing each other they produce a powerful suggestive effect preventing anyone passing between them. This is a psychological effect; no measurable physical force is generated. It is conjectured that this is the primary function of the statues, and in and of itself this effect is harmless. If the line of sight between the two statues is broken, a more dangerous aspect of SCP-531's effects manifests itself. Observers will be drawn to meet the gaze of one of the orphaned statues themselves. Once the gaze is met by an observer he is unable to break eye contact without an effort of will beyond the capability of most people. The trapped individual will feel a mental pressure forcing him to crouch down so that his eyes are level with the statue's. After several minutes in this pose the subject's body begins to slowly stiffen and become heavier as a transmutation effect takes hold, converting the subject into a duplicate SCP-531 over the course of approximately one hour. The subject remains aware throughout the process but will remain unable to break the statue's gaze. Once the physical transmutation has begun there is no known way to halt or reverse it. The duplicate is an exact copy and produces the same effects as the original SCP-531 statues. It is unclear whether this duplicative effect was intended by whatever agency created the original SCP-531s or if it is a side effect of the powerful link between the two statues. It is proposed that SCP-531 statues could be put to use as part of Foundation security and containment measures. They could theoretically constrain the movement of sapient SCPs that physical barriers are ineffective against. Figure 531-BB-1 shows one hypothetical example of an arrangement of ten SCP-531 statues that should create a pentagonal "cage" approximately 6 meters in diameter that any entity affected by SCP-531 would be unable to exit. This has not yet been tested in practice. 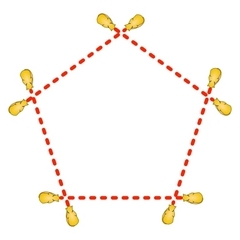 A hexagonal arrangement is also possible, but the experimentally-determined critical viewing angle leaves very little margin of error in this case. 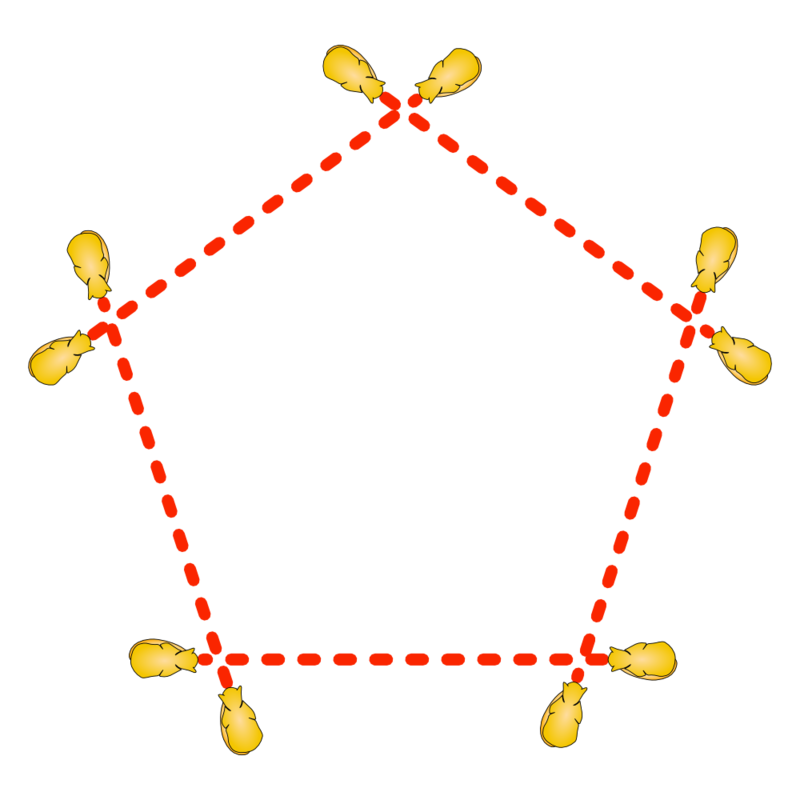 Figure 531-BB-2 depicts a segment of a "fence" of arbitrary length using the same angles as the pentagonal cage. 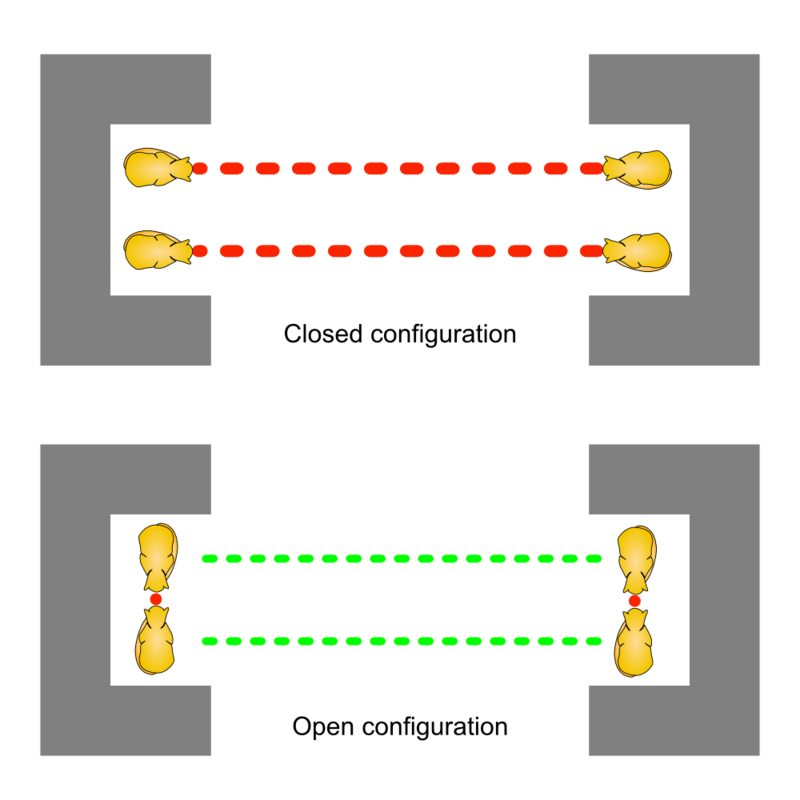 A feature of this proposed design is that the SCP-531 units are mounted on platforms that can rotate 36 degrees, triggered simultaneously along the entire length of the fence. 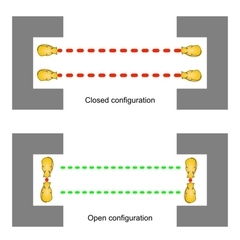 Triggering the rotation should cause all of the units to simultaneously "switch partners" to the unit immediately beside them, opening the entire perimeter. A fence with this design will require one SCP-531 unit for every 1.5 meters of length (using a maximum unit-to-unit distance of 5 meters). 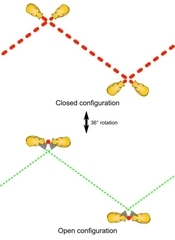 This same mechanism of rotating units can also be used with the pentagonal cage described previously. 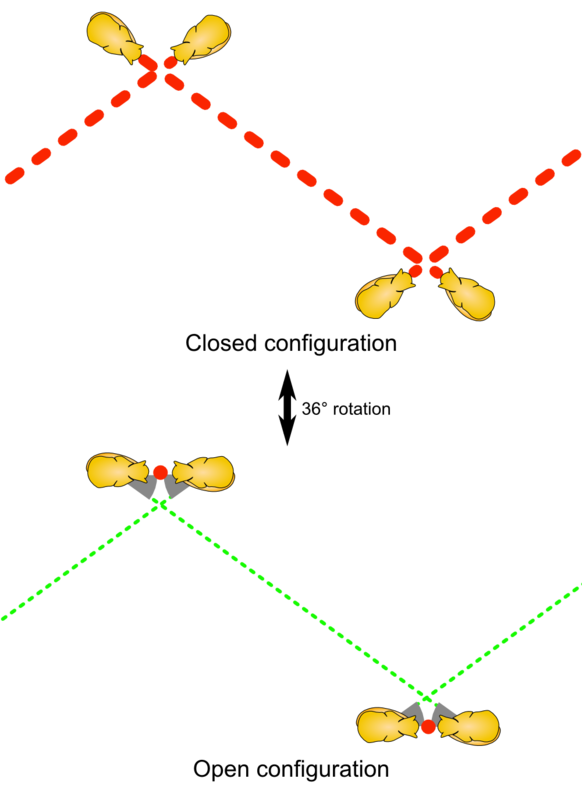 Figure 531-BB-3 shows a switchable gate arrangement utilizing a 90-degree rotation of four SCP-531 units. Alternately, a single pair of SCP-531 units could be used with retractable opaque barriers over the alcoves, much as is used in containment when individual units are removed from storage for testing. This alternative leaves the SCP-531s unpaired while the gate is open, however, which may prove to be a hazardous situation during long term use.